Brush the aubergine slices with olive oil and grill in a hot griddle pan for 1-2 minutes per side. Set aside. To make the sauce, sauté the onion in a saucepan in a splash of oil until soft and translucent. Add the garlic and mushrooms and fry until the mushrooms are golden brown. Add the remaining ingredients and allow to simmer for 10 minutes until the sauce has reduced slightly. 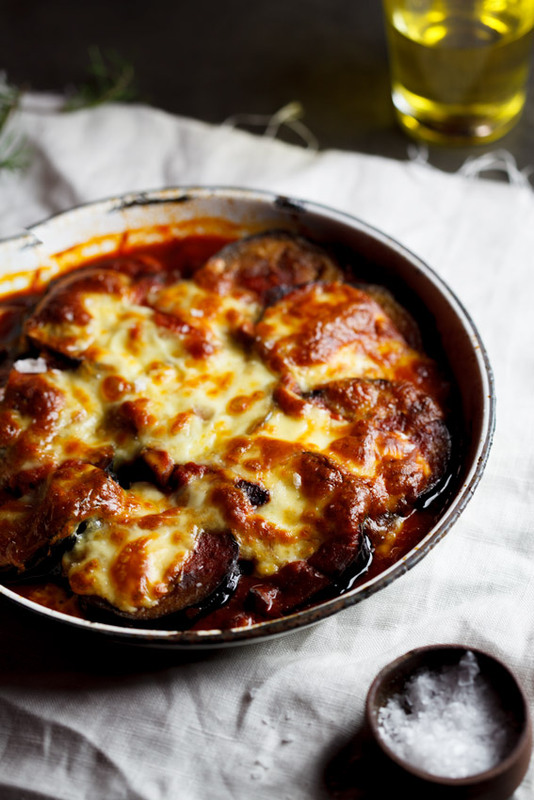 To assemble the bake, layer the grilled aubergine with the sauce and cheese in an oven-proof dish, reserving some of the mozzarella to finish the bake off with. Place the dish in the oven and allow to bake for 15-20 minutes until the cheese is melted and golden. Remove from the oven and allow to cool for 5 minutes, then serve with salad or bread of your choice.